Parking rear view priority: The monitor will start up automatically, and synchronously display the video from rear view camera when you're backing your car; the monitor will close itself after backing. Scenes will cut to rear view camera automatically while you're backing the car and change back to the original scene after that. Power supply: DC 12 24V. Work: 0 to 80 degrees C.
Storage: 10 to 80 degrees C.
Attention: Blue wire is for displaying car reversing image automatically when it's connected with a rearview camera.You need to adjust it manually if the blue wire is not connected. Product Dimensions(L x W x D): 193 x 135 x 25mm. 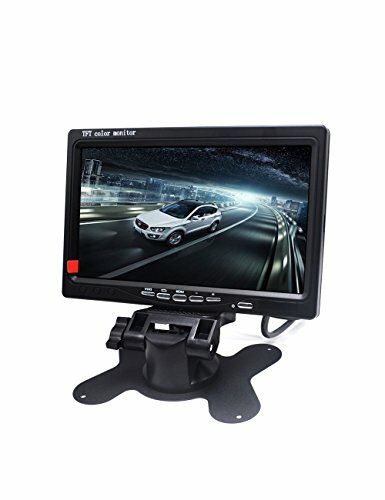 1 x 7" Car Monitor. Two RCA video can connect to GPS, DVD, PS2, Xbox or rear view camera etc with RCA video port for displaying purpose. Built-in Speaker and remote controlled. Note: Uses 9 volts. Chromatic System auto switch PAL and NTSC at AV mode. Note: This LCD is especially designed to connect to your car's camera. If you have any questions about this product by Zettaguard, contact us by completing and submitting the form below. If you are looking for a specif part number, please include it with your message.